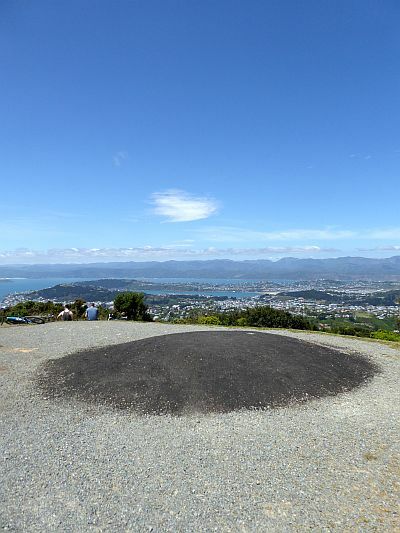 Wellington is a city shaped by earthquakes both past and future. 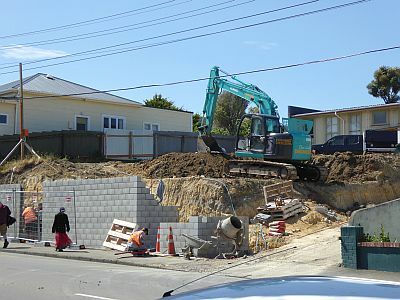 Even distant events affect it: it was the Christchurch earthquakes of 2010-11, and then the Seddon swarm of 2013, that caused many local buildings to be re-assessed on the basis of new engineering knowledge or the damage suffered. 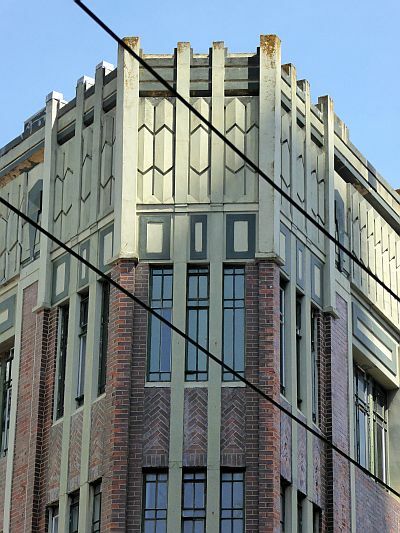 Most notably, the Town Hall has been out of commission for two years and labelled ‘earthquake prone’, that curious misnomer affixed by law outside many places of business that nonetheless remain open. Not our main civic building, however. That will remain closed for an as yet unspecified number of years. but any photographic catalogue of the life of the city will feature some of those sudden departures. 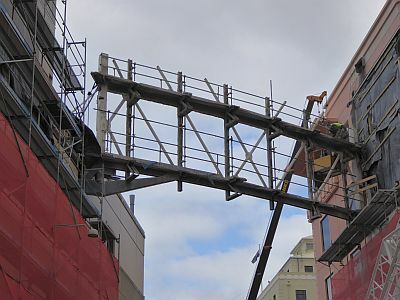 This is how we lost St Cuthbert’s church in Berhampore, or the bridge that connected the library to the rest of the council. 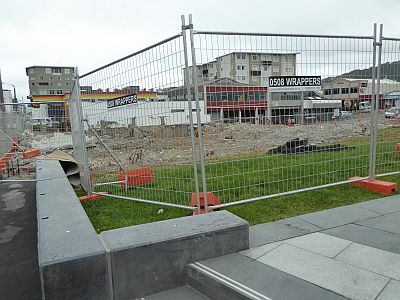 A building adjacent to the newly built Pukehau Park had to go. I can’t remember what it looked like already. 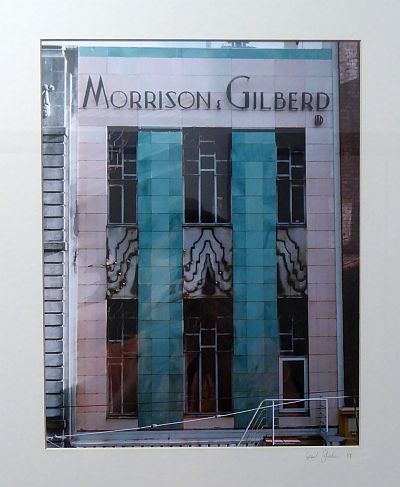 While the GHQ Building across the road – a listed historical site – is slated for demolition. 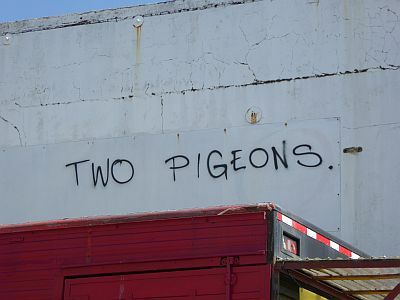 In February, it was visited by pigeons. 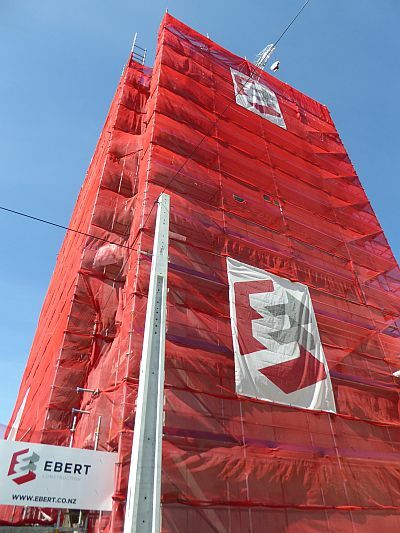 Of course, like in any other city, there are buildings and structures that are demolished or replaced for reasons other than calamity, creating new sight lines and temporary empty spaces. The state housing flats up the road are gone, replaced by a field. So is the wind turbine in Brooklyn. 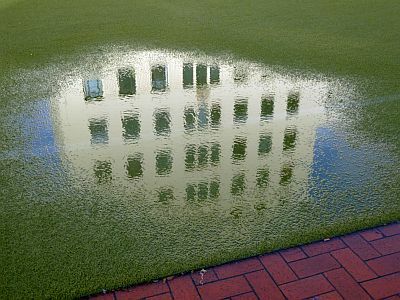 And this is the bit of sky where Neil Dawson’s fern globe sculpture used to be. Some things are being preserved and restored to a previous function, like the community centre in the Centennial Flats. 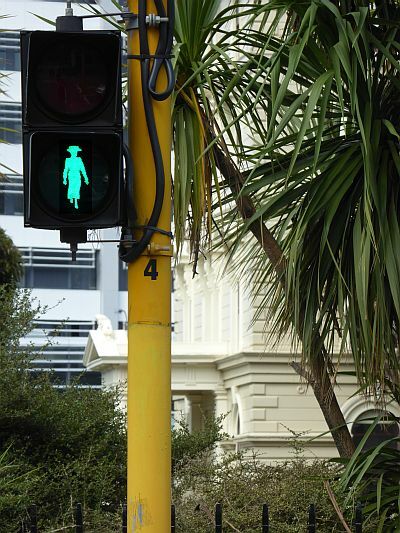 And then there are the Kate Sheppard lights, that were never in danger of disappearing except a Mayoral hopeful thought it might help her cause to pretend that they were. Kate says: don’t vote for Nicola Young next year. 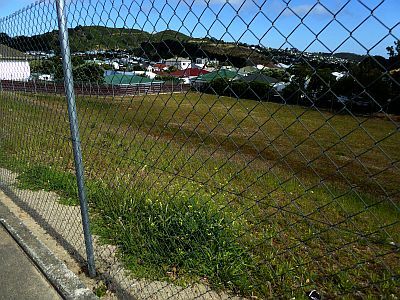 Some other pictures I took in Wellington in 2015. 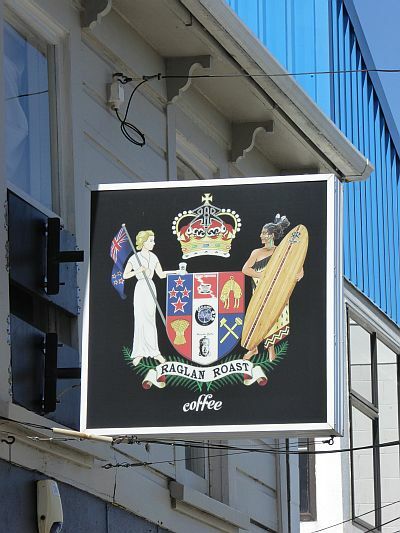 The city’s emblem (‘suprema a situ’), versus a new coffee shop. 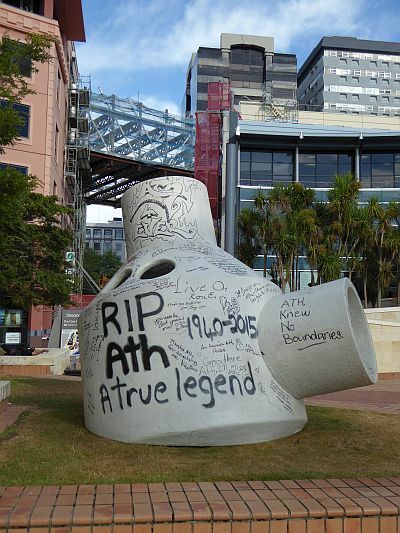 In the Civic Square, whose architect – Ian Athfield – died this year. 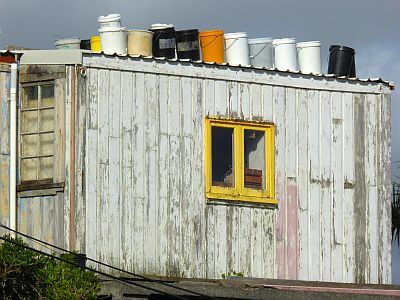 House with buckets, Houghton Valley. 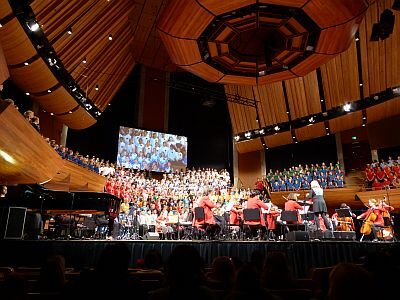 This year’s Artsplash at the Michael Fowler Centre, featuring hundreds of children (and my daughter). A section of my partner’s suffrage-themed art installation in Central Park. 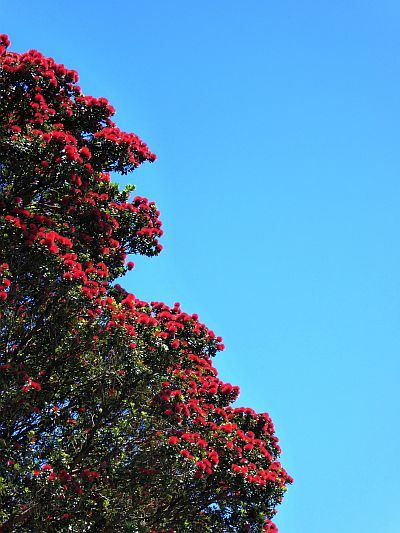 The pōhutukawa were especially beautiful last summer. That seems a suitably seasonal image on which to finish. If you visited this blog in 2015, thank you for making the enterprise worthwhile. 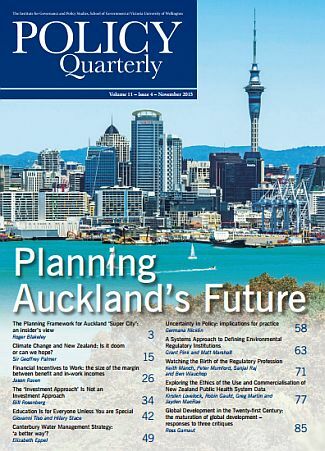 And if you’re running out of reading material, you can browse the Aotearoa Issue of Overland, which is now fully online. Or my latest on the Hager case over at The Pantograph Punch. Or that paper on disability in education that Hilary Stace and I wrote. Or if you're looking for a Christmas present for the discerning reader, you can buy this year's Tell You What. It was good to be involved in those things. Last week Justine and I gave our oral submission in front of the Science and Education Committee of the House of Representatives. Over the last few months, thanks to the initiative of Green MP Catherine Delahunty, the Committee has been conducting an official inquiry into school supports for dyslexia, dyspraxia and autism. As always in these matters – this is far from the first inquiry in the area of inclusive education – it is difficult to be very optimistic about the policy outcomes. In this particular instance the Ministry of Education has been busy conducting its own separate mini-inquiry, by means of a woefully poor round of consultation. I can’t imagine it will change course without putting up a big fight, labouring as it does under the illusion that things are basically fine and that tinkering is all that is required. Yet this is precisely the value of these exercises: to provide our political and administrative bodies with evidence to the contrary. Evidence that can be tremendously helpful when campaigning. Evidence that you can use the next time an official tries to tell you that everything is fine. The inquiry received 440 submissions, most of whom are archived and can be viewed on Parliament’s website. In whichever order you choose to read them, they are a harrowing catalogue of systemic failures to look after our children. And that’s the other thing: taking part in these exercises can be quite distressing, but also cathartic. For many, it’s the first opportunity to be heard outside the small world of struggle and need that is often created around a disability in the family. You can go on living in that world for years without anyone ever asking not just ‘how are you?’, but much more importantly: ‘What is it like?’ This I suspect was the reason why as many as 174 people asked to be able to appear in front of the committee. The inquiry was all those things even for us, who are luckier than most, as we live in a supportive community and have been able to share our experiences in other forums before. 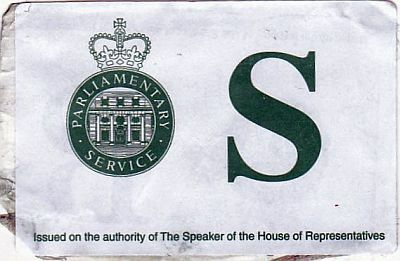 So we sat at the our table in the committee room in front of eight MPs, who sat in front of some men in suits (likely Ministry of Education officials) that nobody bothered to introduce to us, and prepared to say our piece. Our written submission – which you can read here – included a discussion of the differences we encountered in the care of our diabetic son and the lack of care for our autistic daughter, and that’s the aspect we decided we would speak about. This, in the interest of documenting the process, is the short speech Justine gave. You will have read our submission. We'd like to talk to you a bit more about the comparison between autism and diabetes, because our lived experience with each of these conditions allows us to see on a daily basis just how thoroughly the current system fails those with autism. We can also see how problems with this system could be resolved. From the moment I carried Ambrose into the After Hours Clinic in 2011, the care we have received for our diabetic son has revolved around early intervention and support. We have always been made to feel we were partners with the medical team in helping him have a good quality of life. It was explained to us the day after we got his diagnosis that our goal should be to enable him to participate in society fully, and not deny him any experience because of his chronic disease. More importantly, we have been constantly supported in achieving this goal, and in fact the impression we have is that no other outcome is acceptable for the professionals we deal with. Conversely, the lack of support for autism is the result of a completely dysfunctional system. There are the issues of the lack of early intervention and the lack of trust in parents and teachers, but the main issue is a lack of resourcing. When our daughter was diagnosed, we waited a year before getting any help at kindergarten and had to pay for our own teacher aide. Since then, we’ve always felt like we have to prove that she is disabled enough to get whatever scraps of assistance the Ministry feels they can provide. In spite of having dealings with some really wonderful staff, it is an ongoing lottery, which is very unsettling. We regularly get letters containing bad news that are disrespectful and uncaring in tone. Whenever our daughter's already inadequate support is reviewed, we know it’s likely she’ll get her funding cut, not kept the same – even though her learning needs become more complex as she grows up. This is our everyday life experience and it is very tiring. You probably think that diabetes and autism are different conditions that require different types of intervention. But they are not in fact so very different. A diabetic child who is denied insulin and medical checks will die. An autistic child who is denied psychological and developmental support will suffer so much that many may as well be dead. If the objective of public education is not simply to allow children to go to school, but also to include them as equals, with strengths and weaknesses like everybody else, the two systems should operate in broadly similar ways: which is to say, by empowering families, schools and communities to care for and include both the boy with diabetes and the girl with autism. We have an example of the state getting it right for our son. There is no reason why our daughter shouldn’t be able to have the same expectations in life. After that, we were asked some questions: one designed to get us to say that it was all a matter of attitudes, and not of policy or resourcing, and two that engaged with what we had to say. The whole thing took ten minutes, and it was good to leave it behind us: it had been a nervous two-month wait for the day to come. At the same time we felt hollow, as one does when there is no prospect of a resolution. While I’m on this topic, Hilary Stace and I wrote a long piece for the current issue of Policy Quarterly on inclusive education and the historical failures I have just described. You can read it here and I would really appreciate it if you took the time to do it. As in the case of the inquiry itself, it’s about making people aware of realities that are otherwise hidden to them – a task necessary to our politics. Every house, every parcel of land has a story. 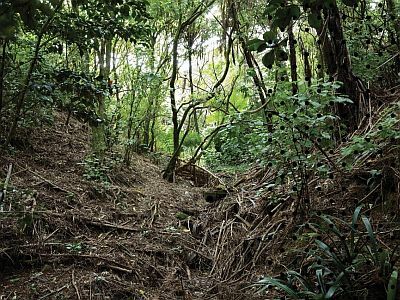 Sometimes that story is geological in nature, and goes back to a time long preceding human settlement. In other cases, it traverses colonialism and dispossession. But this one is a little different. 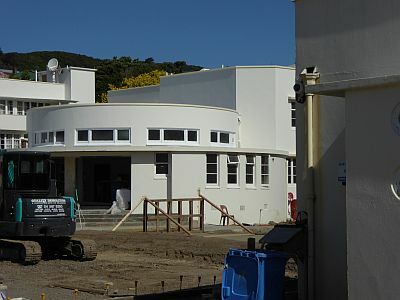 It involves a woman, reportedly the first in Wellington to have signed a mortgage for the purpose of building a house without being in a relationship, and a Jewish architect who emigrated to New Zealand to escape Nazism. And also an artist, and a writer, and another woman – the last one imaginary. The mortgage papers are dated 1957 and identify Nancy Martin as a ‘spinster’. She was in fact a musician, and if you go to the National Library you will find a book she wrote in 1956 on learning to play the recorder, last reprinted for use in schools in 1989, as well as an audio documentary on music education in England: extant traces of a professional life that precede the building of the house, when Martin was in her early forties. It is at this point that her story intersects with that of Frederick Ost, a Jewish architect and artist who fled Czechoslovakia in 1940, and whom Martin chose to design her house, in the modernist style: a decision that suggests in turn a wider, deeper intellectual engagement than the norm – as reflected in the fact that Ost didn’t build many private residences. 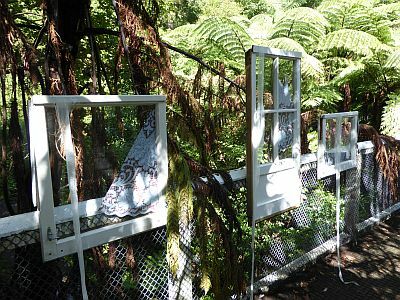 Here, above what is now the Otari-Wilton Bush, Martin created not just a room, but a house of her own, where she lived until her death at ninety years of age. This, I knew in advance, was the beginning of a story by Pip Adam, but I like to think that I would have recognised it anyway, as it was a thoroughly Pip-like story, full of compassion yet at the same time so seemingly dispassionate, so unflinchingly precise. Abigail was the imaginary character: driving past the house and making her way inside, like we had; finding it empty, like we had. Learning from a laptop found on a bench-top something about the past of the house, at the same time as we learned about hers. The two stories, real and imagined, were deftly juxtaposed, so that you weren’t sure which was which. Except for the snippets of stories she read aloud bout Syrian refugees – you knew those were real. The moment the story ended, the house cat came into the room, with consummate timing. And then a woman in the audience turned out to have known Nancy Martin, and so the two stories – Nancy’s and Abigail’s, real and imagined – got separated again. A picture by Shaun Waugh (full size) from the session I attended. Although I'm hiding pretty well. This... I’m not really sure what to call it. Art performance? Installation? Project? This thing I went to was created by artist Ann Shelton, who now lives in the house, and who first unraveled the story of Nancy Martin, then approached Pip Adam to have it reimagined. I knew of some of Shelton’s past works – the re-gilding of Charles MacKay’s name on the stone outside the Sarjeant Gallery in Whanganui; her ‘Library to Scale’ for the Gover-Brewster Gallery in New Plymouth – and I saw her Neil Roberts roadside project while we drove through Taranaki: all things that are very much close to my interests So I made sure I went to House Work, a one-off event held over this past weekend (although there’s a book). And I wasn’t disappointed. 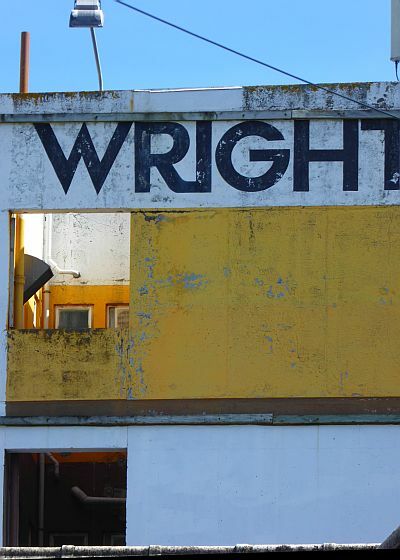 I am fascinated by attempts to re-activate and make visible local social histories, be it by means of visual architecture as in the case of Foxton, through books that document the lives of communities like Berhampore’s, or in art projects such as my partner’s. Shelton’s House Work was akin to a civic re-enactment in its theatrical form, with the house serving as both the topic and the stage. Adam’s story wove presents and pasts together, including the possible alternative present of an imagined guest. 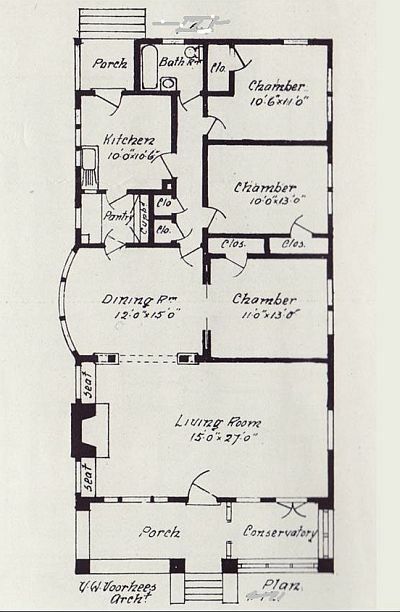 But invention would have been an implicit theme anyway: for the second half of Nancy Martin’s life in a house built for her had to plotted first. It was a thing not done before, in a place that wouldn’t have existed if not for that act of creativity and daring. There are countless such pasts in the places we inhabit. The best stories, the ones most worth unearthing and retelling, are the ones that suggest not just continuity but possibility: a sense that things weren’t always so, and can be made different again. In a year of war commemorations shot through with the most reactionary forms of nostalgia, these stories are nothing short of vital. Ann Shelton’s House Work is part of the Feminisms exhibition currently showing at Enjoy. At the gallery you can also purchase the book based on the project, A Spoonful of Sugar. Five police officers arrived at the journalist’s house at 7.45 on a Thursday morning. The journalist was in another city that day but they knocked anyway. His daughter was home, and opened the door in her night-gown, thinking it was probably a courier and she would be able to despatch things quickly. It wasn’t. The officers informed her that they had a warrant to search the house. She told them her father was away. They told her they were going to go ahead anyway. We know from court documents that, had nobody been home, they would have forced their way inside. I’m going to ask you to forget that the journalist was Nicky Hager. Well, kind of. You need to bear in mind some facts that are specific to this case: for instance, that the crime the Police was investigating with such an investment of manpower and force was relatively minor, but had great media visibility and political reverberations; or that the search came twelve days after the general election that returned the National Party to power; or that Hager wasn’t a suspect, but merely a witness, and that his daughter wasn’t even a witness and had no role in the investigation whatsoever. All of these things are worth keeping in mind, for they are what makes this case extraordinary. They are reasons that moved me to argue before that the eventual decision by the High Court concerning the legality of the search will have significant implications for our democracy. But we must remind ourselves of the extent in which this case was also quite ordinary. That is to say, of the fact that the Police acted the way they did because it is natural to them; because this is how executive power works, and because – like at Ruatoki in 2007 – it comes with very little cost or likelihood of checks. And so on that Thursday morning in early October of last year, five police officers entered the journalist’s house, allowed his daughter to call a lawyer – upon her request – and, when she got no answer, commenced the search anyway. When she asked to get dressed by herself in the bathroom, they told her she had to do it in front of a police officer, as if she could have secreted on her person the information they were after. They then proceeded to search her room, rifling through her drawers and her private photo albums: again, as if there was a likelihood that this person, who wasn’t even a witness, might have hidden the information there. They cloned her phone, on which no journalistic privilege could be claimed, copying all her contacts and taking a year’s worth of personal messages, which they planned to review later. This person whose only crime was to live with her father, in the house of a journalist. Then they seized her laptop – because of course they did – just two weeks before the final papers for her Honour’s degree in History were due. Only after the intercession of one of her father’s lawyers, who had arrived at the scene in the meantime, was she allowed to copy the six files she needed most urgently; she otherwise managed to complete her degree using a borrowed computer and after being granted extensions on two of her course requirements. Her laptop was finally returned 5 months later. Think how you would do without it, and all of the private information you would have accumulated on such a device. In an affidavit, she describes the ten-hour search as exhausting and upsetting, and lists having to get dressed in front of an officer and the prospect of her private communications being read by the Police as particular causes of distress. While they were searching her room, she felt she had to leave. Then there was her father, the journalist: that is to say, a witness, according to the documents discovered in court, or more precisely an uncooperative witness – who got this designation in spite of the fact that the Police had never sought to speak to him. 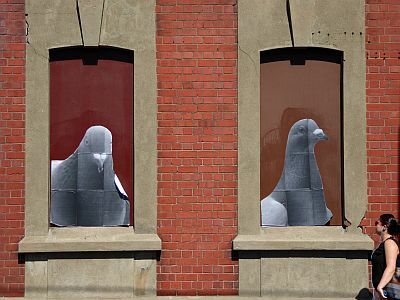 He was in Auckland on the day of the search, which matters a great deal seeing as his absence would allow the Police to not just seize but search the contents of his house, without him having a chance to claim journalistic privilege on any of the material. 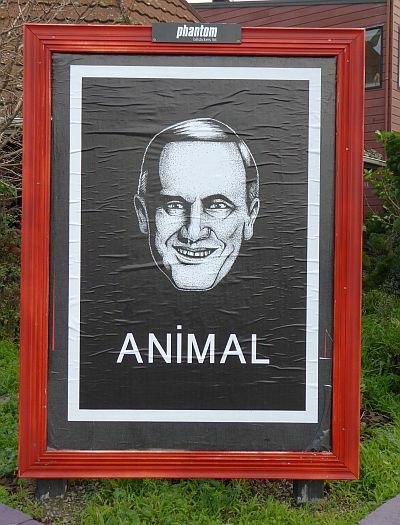 He was in Auckland to give two public lectures, so hardly on a secret assignment. I’ll leave it to you, the reader, to speculate whether it was incompetence or malice that led the Police to his house on a day when he was away. But it’s at this point that his daughter being at home becomes a silver lining: for she managed to get hold of her father, and eventually of his lawyers, which managed to protect some (but by no means all) of his privilege. Yet even in this, not the worst of all possible scenarios, the Police seized every document they could find, including materials related to all of the journalist’s current and past investigations, imperilling the confidentiality of countless sources – including sources for investigations on the Police’s own conduct – and effectively destroying his ability to work. To all this we need to add the searches conducted outside of Hager’s home, which involved among other things informing all New Zealand banks that he was being investigated for fraud (he wasn’t), or asking airplane carriers information on all the domestic travel he undertook, as well as the names of the people sitting next to him on those flights. 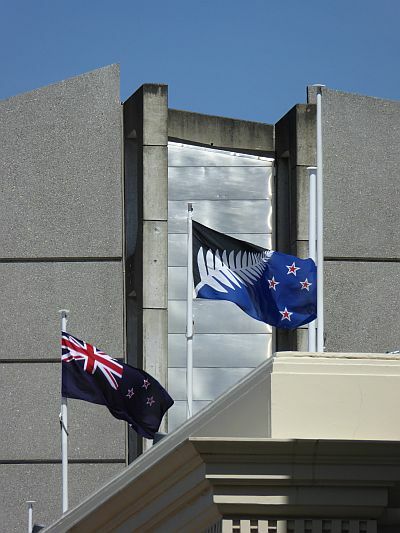 The combined effect of the two searches – of the journalist and of his daughter – suggests a comparison with the Police raiding the offices of The New Zealand Herald and seizing everyone’s computers and the entirety of the newspaper’s archives. 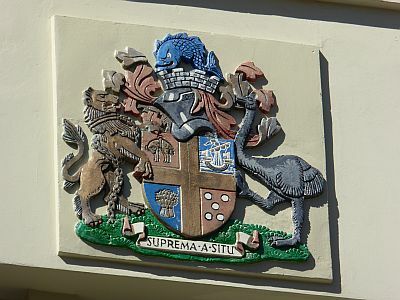 As David Fisher wryly remarks in an affidavit for the Court case, one doubts that the Police would have raided a media organisation had the story originated there, ‘not least because of the resources it could bring to bear to oppose such treatment’. The comparison reminds us that the fourth estate is just that: an estate, that is to say a power which the executive has to reckon with. The independent journalist, while granted the same protections in law, is much more vulnerable, as well as a prime target for political intimidation if need be. Which goes to the heart of this case. However, if we examine the raid as a discrete series of events, what we are faced with is not an abuse of power, but its ordinary exercise. The Police planned the raid the way they did because nobody was there to tell them to stop. They found an accommodating judge to sign their warrant because you can always find one of those. They raided the house when the journalist wasn’t there because they could either pretend not to know he was away, or not bother to find out. In any case, they were prepared to break in. Had they broken in, his privilege would have been destroyed, but power needn’t care about that. Power found a way, and it barely needed a motive, to get what it wanted. It knew it could raid first, answer questions later, because the cost of those decisions would be borne by the rest of society. So when you think of the intrusion and the disruption and the violation that two particular citizens – Nicky Hager and his daughter – have described, think of other investigative journalists, or targeted communities, or political dissenters. Think of the chilling effects not just on confidential sources, but on our collective ability to sustain critical institutions. Think of the cost of going against that power which still so many, too many, view as a benign force. The legal issues this presents are for the Court to determine. But from my position, as the person raided, this seems an inherently unjust process. The Police seized my business machines and papers, caused me thousands of dollars of cost, hundreds of hours of work, and months of disruption to my work, threatened the viability of my future work and livelihood, and caused upset to my family, all without considering whether any of this was lawful or justified. I have not committed a crime. I was told by the Police that I am not a suspect. And yet, the Police have turned my life upside down and have delayed any issues about whether the raid should have taken place to be sorted out in Court later. By this point, much damage has already been done. The Court documents that have been released so far, in redacted form, are available at Scoop here and here. A reminder that Nicky Hager's daughter's name is suppressed so please keep it that way. Justice Clifford has yet to publish his decision. Some of the letters we received over the last few years. Several pre-approved credit card offers from American Express. A pre-approved loan of up to $25,000 from Harmoney. 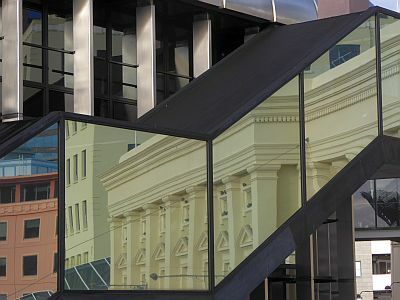 Two offers to upgrade to a platinum credit card from The National Bank (now ANZ). A letter informing us that our monthly credit card limit had been increased overnight by $27,000, if we would only phone to confirm. Then there was that time they sent me a replacement Air New Zealand airpoints card in the mail and it had magically mutated into a MasterCard platinum credit/debit card with PayWave technology, just waiting for my say-so to be activated. The services that you didn’t even ask for and that come into your home: those are the creepiest tendrils of capitalism. What most of these letters have in common is the promise of access to wealth, as opposed to debt servitude. In some cases – American Express, the National Bank’s platinum card – the offers have a whiff of old money about them: white-gloved waiting staff opening doors for you, perhaps on the way to a classical concert where you will mix it up with other high-class people. Nothing about our postcode or our finances would counsel these assumptions, but I’m sure the marketers know what they’re doing, and that pushing certain buttons works on folk like us. The other approach is selling the aspiration without actually pretending that you do have access to the funds. Harmoney has the best line here. The offer of a pre-approved loan* they mailed to us in February of this year contained a list of helpful suggestions for things we might want to buy even though evidently we couldn’t afford them. It ran like this. 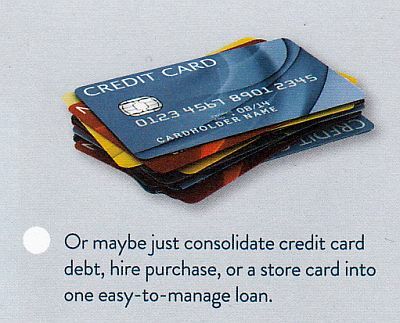 Only at the bottom did the company venture to suggest a more reasonable use for the loan, namely the consolidation of existing debt at a (possibly, hopefully) lower interest rate. Elegantly, the asterisk in the Harmoney letter stands for – and I paraphrase – ‘this loan is not actually pre-approved’. Here’s the exact weasel wording. This pre-approval is indicative for purposes of borrowing money through Harmoney. It is based on the information available to us at the time this letter was sent. The result when you register as a borrower to use the Harmoney service may be different to that which is provided here. In providing you with a pre-approval Harmoney does not represent that you will be successful in borrowing money through the Harmoney service. If successful and you apply in full, you could have money in your account within 2 working days. We only have to walk down the road to the Newtown shops to find the brick and mortar equivalents of Harmoney’s ‘service’: companies like Aztec, Geneva and Instant Finance, where people who wouldn’t qualify for a credit card or a personal loan at a regular bank can go to get money quickly to get out of a jam. Hence the 2 working days promise: nobody needs a swimming pool or a campervan holiday quite that urgently. It’s when you have wolves at the door that you need the ready cash. There were protests outside our local branch of Instant Finance some years back, targeting the role of rugby league star Stacey Jones in promoting the loans among the Pasifika community. 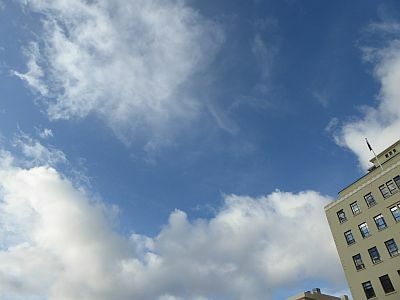 But even these companies seem to have a certain reassuring presence – you can at least point to the buildings – compared to the online lenders, which a new law passed last year struggles to control. Like online gambling, online instant finance is often presented as an exciting opportunity. 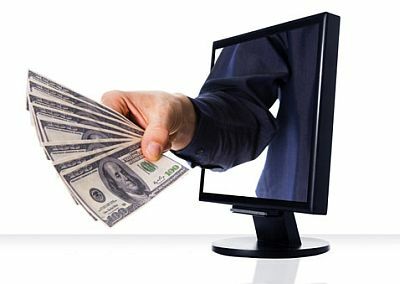 In one of my favourite images, from a US payday loan site, the money reaches into your home directly through the computer screen. Breaking with the genre, Harmoney makes an appeal to family and offers two options: to borrow or to invest (that is to say, lend). 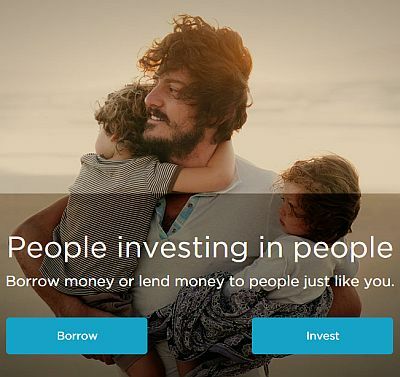 For Harmoney is a peer-to-peer lending platform, the first of its kind to have been licensed in New Zealand. Now peer-to-peer has to be the most spectacular misnomer in the history of language, given that by the very definition of the service the money goes from those who have it to those who don’t; not to mention the fact that the $100 million seeding money for the operation came from just four investors, who I strongly suspect will remain peerless. But TradeMe has a stake, and the press has been positive, and so we’ll have to regard the fact that they hawked their loans to us via the suggestion we borrow up to $25,000 to treat ourselves to a swimming pool as business as usual, that is to say, the free market doing what it does best. All we have to do is find a ‘peer’ willing to lend the money to us. Everything going well, it will be ours within two working days. Spiralling levels of household debt – hidden inside fantastically opaque financial products – were among the causes of the Global Financial Crisis, so there is something especially lurid about the cheerfulness with which these products are promoted, so soon. But then the vision offered by the marketing brochures is not so much one of living beyond our means as independently of them: as if money will never matter again. A platinum credit card will ensure the hand that opens your door wears a white glove. A lavish holiday can be afforded now, paid for at a future time that is increasingly uncertain. Soon there might be an app uncoupling us from the financial system altogether. Like Uber, but for usury, allowing us to lend and borrow freely, and become the loan shark of one another. There might as well be. I am a very boring cook. My role in the family is largely to make staples – bread, biscuits, pizza, focaccia – during afternoons spent with the children. I enjoy the repetitiveness, the way it fills out time. It’s also a great help for the grocery budget, for such basics are where you can make the greater savings. Culture helps here in that the Italian cooking repertoire is all about stretching the food budget. What are even delicacies like ravioli or cappelletti but an elaborate device to make use of food scraps? What you give up in exchange is time, or labour which is the same thing. My irritation at their use of social media folks as organic advertisers notwithstanding, I understand the attraction of My Food Bag – sort of. If I were the person in the household in charge of varying the diet, I might appreciate the parcels of food delivered to my door. Ultimately, however, I object to the transaction: it’s the convenience of having to cook yourself for the price of eating out. I am culturally conditioned to find this far too extravagant. My own food bag plan would probably come down to six words: start buying flour in larger bags. Also: I’m not delivering that. 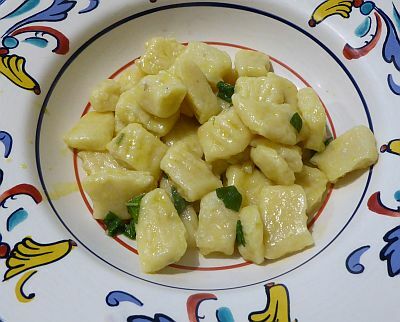 Lately I’ve started making fresh gnocchi, and I offer the procedure today to fulfil a pledge I made to fellow antiquarian blogger Ms Moreau, so all complaints should be directed to her. It’s a very budget-conscious preparation, as not only the ingredients are fantastically cheap but it requires virtually no equipment (chiefly: a pot, and fire). Just as importantly, gnocchi are very nice and children generally like them. You can even stuff vegetables in the gnocchi themselves, and the little blighters won’t suspect a thing. Ingredients: four cups (500 g) or flour; two size 5 eggs; two teaspoons of salt; 1,300 grams of potatoes. This is actually a double batch, as it saves time to make two lots at once since the preparation is quite fiddly. Also: it may seem a bit odd but I actually put gnocchi straight in the freezer, rather than consuming them fresh – this helps with setting aside the time, and provides all-but-ready meals when needed since you just chuck them in boiling water anyway. There’s no need to thaw them out. If you want to impress your friends, just halve the quantities and prepare on the day. The procedure is exactly the same. First you put a pot of water on, then scrub your potatoes. Do it well, and it will save you from having to peel them later. What potatoes look like. Remember, this is the quantity for a double batch. Put the potatoes in the pot as soon as the water starts boiling. 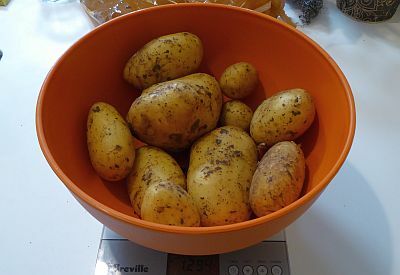 The time taken here depends on the age and type of the potatoes (older, floury ones require less boiling). Test the consistency of the biggest potato with a knife, which should find very little resistance. 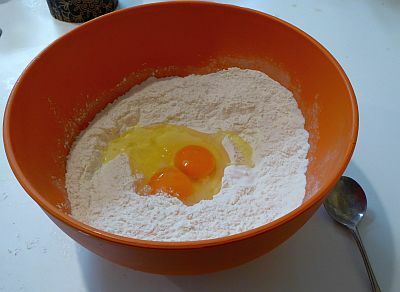 In the meantime, you will have mixed three cups of flour with the salt, and added the eggs. 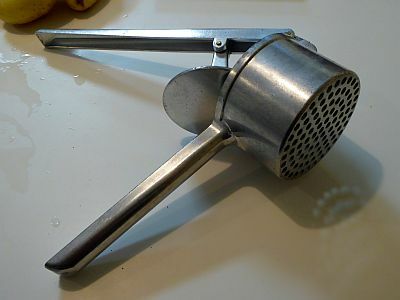 Now, if you own a potato ricer, use that as it will separate the skin from the pulp. Otherwise, peel and mash. This is my heavy-duty ricer, sturdy enough to make mericonda. Either way, you’ll end up with something like this. 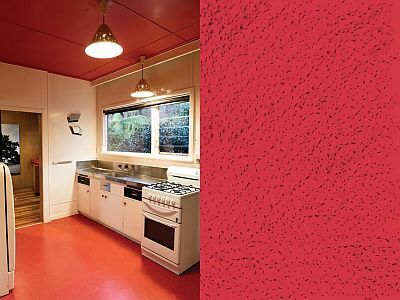 This is the time to lay out the board or surface you plan to use, the remaining cup of flour and a lightly floured tray or plate that fits in your freezer. Get out a sharp knife and a fork as well. Your hands are about to get quite dirty. 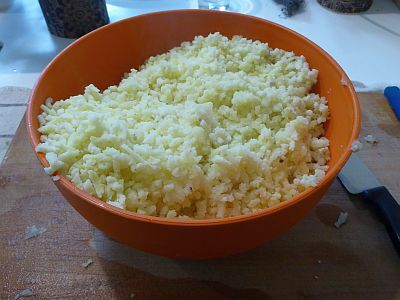 Now mix the ingredients, first in the bowl, than on your working surface, until they form a soft, wet, slightly gelatinous ball. It’s really not very attractive. 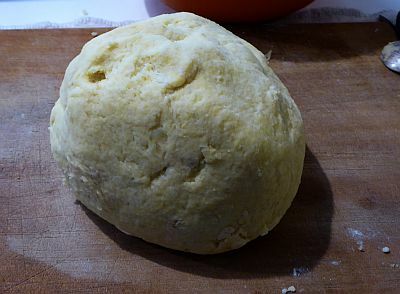 Take a small ball of dough and place it on the working surface. 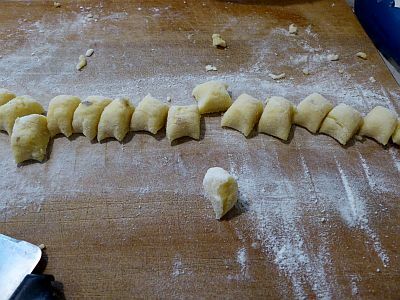 What I do here – instead of incorporating flour into the dough at the start – is to add the remaining cup a little bit at a time while rolling the gnocchi out, as needed. This ensures I won’t add more than required to prevent them from sticking, as ideally you want to taste the potato more than the flour. 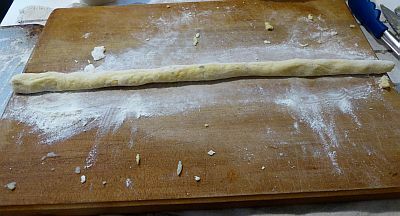 Roll the bit of dough out into a worm. Using a knife, cut the worm at regular intervals, roughly the width of a finger. 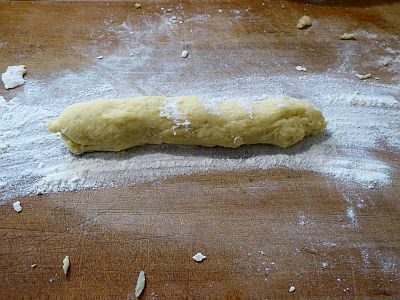 Using a fork, scour the square surface of each gnocco – where you made the cut – to give them the characteristic shape (it will provide folds for the sauce to cling to). Alternatively, you can use a special implement designed for this purpose. If you own one of those, please close this web page immediately. 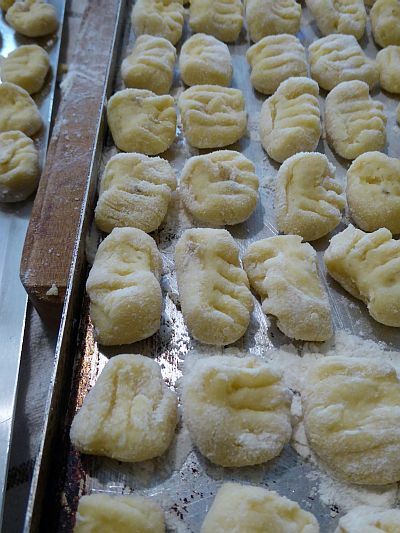 Place the gnocchi on the floured tray or plate. Once full, move to the freezer for 20 minutes or so. 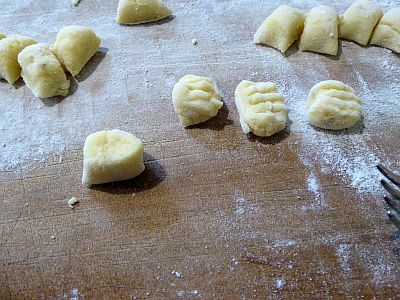 As soon as the gnocchi have hardened, they will no longer stick together and you can put them in a plastic bag. In this state, they will keep in the freezer for a very long time and don’t take much room. The double batch should make two lots of roughly 800 grams each, good for two meals for 4 adults. To cook, boil a pot of water, add salt, dunk in the gnocchi. When they come to the surface (it won’t take more than five minutes, even from frozen), they’re good to go. Gnocchi are good with most sauces that go well with fresh pasta. Pictured is a basic butter and sage sauce. Even if you splash out for Parmigiano, it makes for a very cheap meal. Alternative preparations: you can incorporate boiled seasonal vegetables into the dough. For instance you can make orange ones using pumpkin, or green ones using spinach. I’m told children enjoy this. What we did enjoy at school when I was a lad, and were served mushy gnocchi on Thursdays from the school canteen, was to carefully lick the tomato sauce off them one by one and put them back on the plate, thereby pretending that they came with no sauce to begin with. I couldn’t tell you why we found this funny but we did. Also, we still ate them afterwards. I read the book at some indeterminate time of my childhood, along with my first story by Edgar Allan Poe, which was part of the same series. Then both books were exiled on a high shelf in our living room, behind another row of books, and for almost three decades it was as if they had never existed. I salvaged them, finally, just as the vast majority of my parents’ large library was given to a charity that turned it to pulp. Which was a very sad day. I picked it up again about a month ago, feeling a little guilty about always returning to the old books instead of tackling the new ones. Is it a subconscious defence strategy? But we can all do with our comforts, and this one’s mine. An old book that’s been in the family, a cheap edition which falls apart as I handle it. Every reading is an injury. 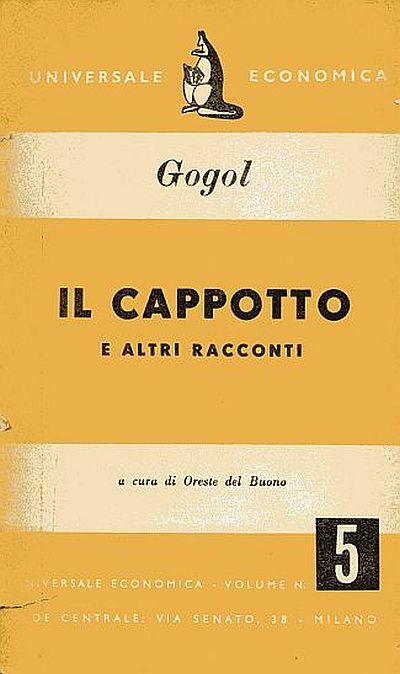 Printed in 1952 by the ‘Popular Books Cooperative’ and priced a very modest 150 lire, this 100-page collection of Nikolaj Gogol’s most famous stories – ‘The Overcoat’, ‘Diary of a Madman’ and ‘The Nose’ – has two more virtues besides: an introduction by Oreste del Buono, who along with Umberto Eco was instrumental in elevating comic books to the same status as other forms of popular literature in Italy, which made him an important cultural figure during my adolescence; and a beautiful but sadly uncredited translation. This, I realised some years ago, was the mistake I made when selecting the books I would take with me to New Zealand when we first moved here: to have chosen Italian books that I could fairly readily find here, instead of Italian translations of foreign works in French or Spanish or Russian or Chinese. I know this is preposterous, but every work of world literature translated into English sounds slightly wrong to my ears. I second guess the work of the translator, doubt that this or that passage is faithful to the source. Italian seems more natural not just as a transition from other romance languages, but also quite simply because it will always be, to my native ears, the language in which stories speak. And there’s nothing I can do about it. Old, outdated translations, if anything, seem closer to the source, as they match the age of the original more closely. And if they were produced during Fascism – as this one probably was – they have an extra element of curiosity in the banishing of foreign words, and the translation of any translatable first names, which should be bothersome, but actually isn’t. Gogol himself is ‘Nicola’. Ivan Abramovic is ‘Giovanni’, Istvan Varlamovic is ‘Stefano’. But not Akaky Akakievich – he stayed the same. The Overcoat has to be the world’s perfect comic story, but even just saying what it’s about takes half of the joy out of it. Or, worse yet, spoiling the ending. It turns out I vividly remembered the description of the old overcoat so worn as to be practically transparent, and the negotiations with the drunken tailor. As for Carolina Ivanovna and the prominent personage petitioned in vain by Akakievich, we hear that the pair had ‘a very frank friendship’ – a euphemism for ‘extra-marital affair’ that still makes me giggle inexplicably. I found this on Wikipedia. 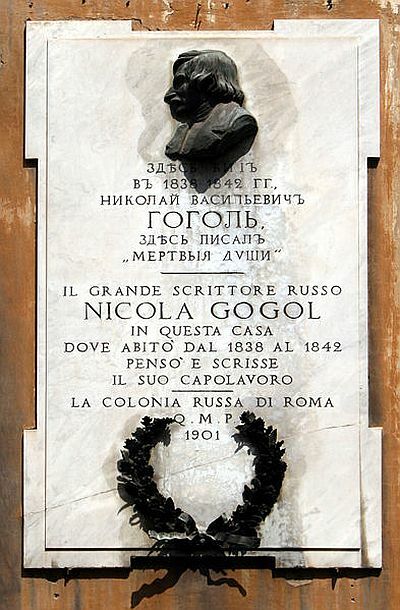 It turns out Gogol lived in Rome at the time when he wrote The Overcoat (from 1838 to 1842), and a commemorative plaque was erected by the local ‘Russian colony’ in 1901. 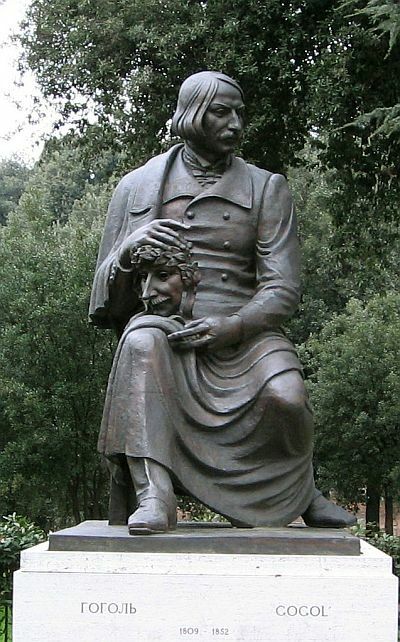 At Villa Borghese there’s a rather wonderful statue of him. I have reached the conclusion that it is ignorance which makes us think that Spain and China are two different countries, when they are in fact one and the same. I suggest you write the word Spain. You’ll see it reads: China. But mostly I find it melancholy and sad. The Nose is the story of a barber who finds a nose inside his breakfast bread loaf. He recognises it as belonging to one of his customers, Major Kovalev, also known as ‘Collegiate Assessor’ Kovalev (because all of these stories are obsessed with bureaucratic titles and the status that comes with them). Panicked, he throws the nose in the Neva. Meanwhile, Kovalev wakes up without a nose. His face is flat, like a pancake. He leaves the house in a frenzy. Next to a pastry shop he bumps into a stranger, apparently a military officer, whom he immediately recognises as the nose, but he cannot apprehend him. Later he finds the nose, which is now back to being a nose and no longer a nose-person, but is unable to stick it back on. A physician says he’s better off without it and offers to buy it off him. Other things happen. The story ends in an argument between the narrator and the author, with a moral tacked at the end. Say what you want, but episodes like these happen in our world. Rarely, it’s true, but they do happen. I put the book back on its new shelf, next to the Edgar Allan Poe, more battered than when I took it down, wondering how many more times, if any, I shall indulge in its particular pleasures, and at the cost of what other new book that I may never get to read.